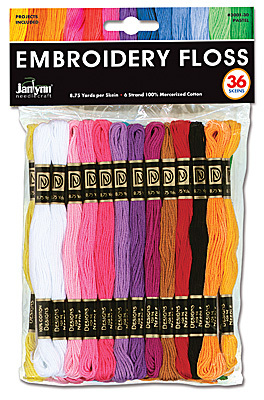 100% Cotton Embroidery Floss Skeins in PASTEL Colors packaged at SUPER VALUE PACK prices! Top quality floss that is versatile for your craft and needlework projects. Each package contains 36 skeins of 8.75 yards (8 m) 6-strand 100% Cotton Floss in a variety of 18 Pastel colors, White, Lt Med & Dk Pinks, Med & Dk Purples, Fuchsia, Lt Brown, Red, Black, Lt & Dk Oranges, Yellow, Green, Orange, Blue, Turquoise and Lime. Product of DFN™, A Janlynn Company.